You may have looked at a curly PWD in a retriever haircut and thought it looked like a teddy bear. Or you may have talked with someone who has told you their PWD is great with children. Well, looks are deceiving--this is a working breed with a strong temperament. They can be great with children provided your breeder has socialized them to children and you have put hours, hours and more hours into training both dog and children to be good with each other. "I grew up around dogs so I know how rough kids can be on dogs. That said, I’ve been working with my daughter and both my “boys” to make sure that they all have as good an experience as I remember having as a kid. This means my child has learned how to sit down and watch when the boys are eating and not take their food, and the boys have learned that if they lick her face too often they will get put on a six foot leash and the other end goes to my daughter. You’ve never seen such a dejected look on a dog’s face as when he learns that he is at the mercy of a 2 year old and she intends to “take him for a walk” 13 times around the kitchen. "This also means that I never leave them alone for a second. I know my boys won’t mean to hurt her but there is always that one incident where they are all having a bad day and someone might get hurt. 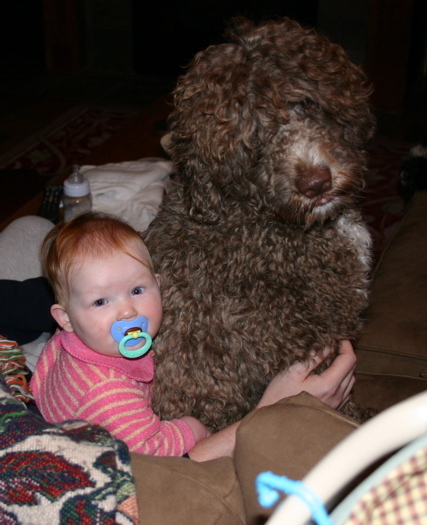 My daughter has been bowled over many times by a dog that just has to get to that squirrel in the yard. And my dogs have had their tails stepped on, bodies leaned on and toys taken away. But on the other side I watch the boys eagerly following my daughter around the yard as she picks up their ball and throws it for them and I’ve seen them all in a heap playing on the bed. It’s a lot of hard work but I think my daughter and boys are going to have some pretty good memories of growing up, just like their Mom does." Remember that most dog bites are inflicted on children. They are smaller, their voices are higher, their movements sudden--all these things create temptation for a dog. Children like to grab noses, throw toys, and shriek--they don't have much sense of "other." Please, if you have children, think very carefully about whether or not this is the time to add an active, headstrong, primitive dog to your family. See PWD Agression: Can It Happen to you?